LinkedIn is on track for the largest flotation of a technology company since the market bubble of 2000. The site's projected value has jumped 30% ahead of its much-hyped initial public offering (IPO) on Thursday. The company said it expected shares to sell for between $42-$45 (£25-£27), giving the business networking site an overall price tag of $4.3bn (£2.6bn). Industry watchers said it could pave the way for other social sites, including Facebook, to go public. LinkedIn's soaring valuation showed how sought-after the top tier of online networking companies have become, according to Yvan-Claude Pierre, a partner with law firm DLA Piper. "Investors have to put their money somewhere. There's a lot of money chasing very few deals," he said. Eager traders and their clients are also eyeing up sites such as Groupon, Twitter and Zynga. However, there is one in particular that they are desperate to splash the cash on. "LinkedIn is like the opening act setting the stage for the main show which will be Facebook," said Ray Valdes, a senior analyst at research firm Gartner. The big question is whether or not LinkedIn can justify the share price hike especially after the company revealed in the risk factors section of its prospectus that it does not expect to be profitable in 2011. "Our philosophy is to continue to invest for future growth, and as a result we do not expect to be profitable on a GAAP basis in 2011," the filing said, referring to generally accepted accounting principles. 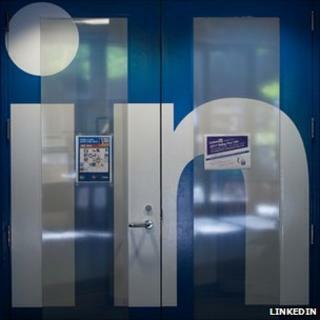 Some investors believe the asking price is over hyped given that it values LinkedIn at almost 17 times its 2010 revenue of over $243m (£150m). Facebook which is six times the size of LinkedIn with more than 600m users, is expected to go public in 2012. The world's biggest social network is valued at 32 times estimated 2010 sales, according to Nyppex, a private share market. By comparison Google's shares trade at about six times its revenue. "I wouldn't touch the stock, I wouldn't own it, not at $45, not at $43," said Eric Jackson, managing member at hedge fund Ironfire Capital. He added that he might be willing to buy LinkedIn shares at a much lower price, like around $25 (£15). While some question the site's proposed share price, other analysts credit the company with good judgement when it comes to the timing of its IPO. "Facebook is encroaching on their territory by adding job data to personal profiles," said Gartner's Ray Valdes. "LinkedIn also needs capital. They have potential value that they haven't fully unlocked. They need to get investment resources to keep up with the major players, namely Facebook. "LinkedIn's valuation is not outlandish as long as you are confident it can execute in the face of such strong competition," he said. The attention that the LinkedIn IPO has received has inflamed talk of a tech bubble reminiscent to that of the late 1990's and the dot com boom when prices for tech stocks were over inflated leading to an implosion of the sector. "I think we are seeing the beginning of a bubble but if LinkedIn does well it would be a validation that there is money to be made in social networking," said Matt Rosoff, west coast editor of news site Business Insider. "Most of the trading in these social networking companies has been in these private second markets. With the amount of funding available out there, it is a good time to start an internet company. This is a rare bright spot in the American economy," added Mr Rossof. In a recent report by SecondMarket, an exchange for private shares, investors expressed the most interest in Facebook, followed by Twitter, Groupon and LinkedIn. One note of caution for the sector came in the shape of Renren, dubbed the Chinese Facebook, which went public earlier this month only to see its shares drop below the IPO price. The French networking site Viadeo, a chief rival of LinkedIn's, earlier this week said it would put plans to go public on hold for now. On Thursday, LinkedIn will begin trading on the New York Stock Exchange under the symbol LNKD.